Your want your event to be something special, and you want your favors to be memorable. If you are using a label to cover an existing product, you want the label to do several things - fit on your bottles, stay on your bottles, and cover the existing label. If you want the cleanest look, you could remove the existing label as shown here, but it is still important to choose the correct size. 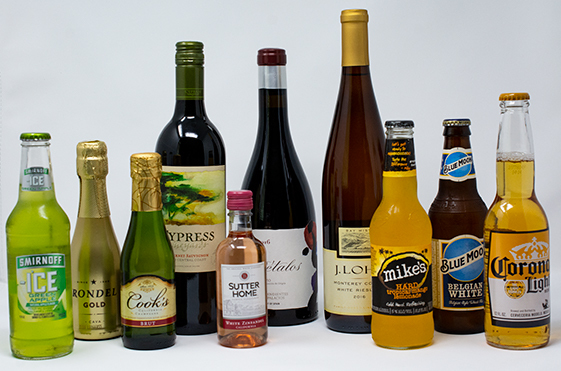 Many times we assume that the labels are standard, but not all bottles are created equally. Yes, many times most miniature champagne bottles have the same dimensions, although the mountable surface may be different. For instance, all bottles have some form of taper, some gradual and some more distinct. It is important to figure this into your sizing decisions. In the rest of this article, we present some things to consider when choosing your label type and label size. Why does the Taper Matter? Labeling up to or over a taper will cause the label to bunch or bubble, this is called a flagging label. 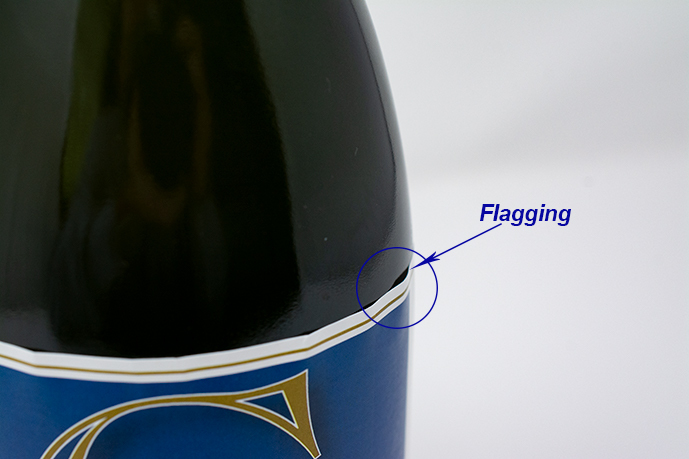 This unsightly wrinkling at the edge of your label may be avoided by properly sizing your label. If your bottle has a narrowing at the top, this is a taper. Most wine, beer, and champagne have an obvious taper - the neck is clearly skinnier that the rest of the bottle. 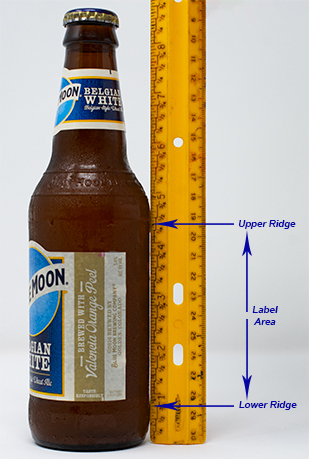 To determine where or if your bottle has a taper, lay a ruler against the side of the bottle from the neck to the base. You should then be able to see where the taper starts and the amount of space available for the label. Weatherproof - our weatherproof label material has a strong adhesive and is perfect for any bottle that may come in contact with ice, water, or moisture. These labels have a white matte finish, are tear-resistant, and can easily adhere to surfaces such as metal, plastic, and glass. We offer two sizes of weatherproof labels - 2" x 8 1/2" for water bottles, and 3 1/3" x 4" or 4" x 3 1/3" for other bottle types. White Gloss - our gloss label material will produce photo-quality results, this high gloss finish is perfect for printing photo labels or high-resolution images. These labels are extremely water and tear resistant, but may soak up water if submerged in water for an extended period of time. Our standard white gloss label comes in 7 sizes: 2" x 3", 3" x 2", 2" x 5", 3 1/3" x 4", 4" x 3 1/3", 4" x 5", and 5" x 4". Our labels are designed to cover a single side of a bottle except for the wrap-around label (2" x 8 1/2") which is designed to wrap around the majority of a water bottle. To properly size your label, we recommend cutting out a piece of paper to match the dimensions of the desired label and place it against your product. This will help you visualize how the label will fit your particular product before placing your order. A second option would be to use a fabric sewing measuring tape and measure the existing label. You would then use these values to find the label that closely matches your particular product. Measuring the Height: Measure the area between the ridges to determine the height. If there aren't any ridges, then measure the area where the curve stops at the top and bottom of the bottle. Take about 1/4 inch off that measurement to make sure you have room to align the label and to prevent label flagging. 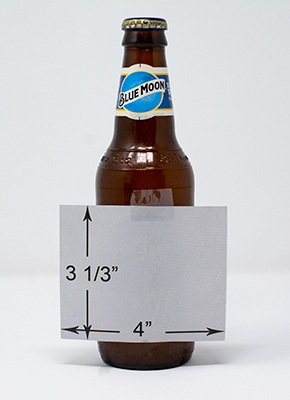 Measuring the Width: To account for the circular nature of the bottle, measure the width of the bottle by wrapping a cloth measuring tape around the bottle and note the measurement where the ends meet. 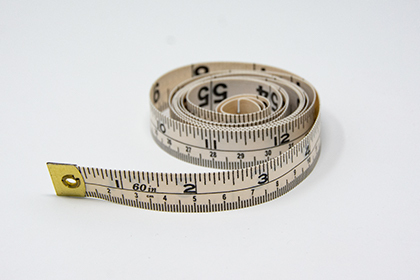 If you don't have a fabric measuring tape, you can use a piece of yarn, ribbon, shoelace, string, or anything flexible. Mark where the ends meet as you wrap it around the bottle. Lay the marked item next to a ruler to determine the maximum width of the label panel. If you only want to cover the label, use the same process above, but stop at the width of the current label. M&M containers - 2" x 3"
beer bottle - 3 1/3" x 4"
wine bottle - 3 1/3" x 4" or 4" x 3 1/3"
sparkling cider - 4" x 5"
miniature champagne bottles - 2" x 3"
champagne bottle - 3 1/3" x 4", 4" x 5", or 5" x 4"
8oz water bottles - 2" x 3"